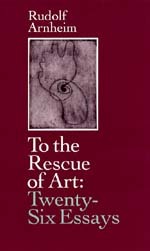 Never before published essays by the widely admired psychologist of art. Arnheim spiritedly asserts art's fundamental achievements. Rudolf Arnheim has spent a lifetime analyzing the basic psychological principles that make works of visual art meaningful, stirring, indispensable, and lasting. But recent fashionable attitudes and theories about art, he argues, are undermining the foundation of artistic achievement itself. The essays collected in this volume are written in his familiar, careful, and solidly supported manner, but under present circumstances they amount to a call to arms. Included is a series of miniature monographs on a variety of great works of art. In other essays, Arnheim uncovers enlightening perspectives in the art of the blind, in architectural space, in caricature, and in the work of psychotics and autistic children. He also presents new scientific aspects on the psychology of art and widens our range of vision by connecting art with language, literature, and religion. Rudolf Arnheim taught at Sarah Lawrence College for many years and was the first Professor of the Psychology of Art at Harvard. He taught at the University of Michigan after his retirement and is the author of ten other books, all published by the University of California Press.